Kasuti can be broken down to ky - hand , suti- weave. Kasuti is called Kashida in North India. Kasuti was done on Ilkal saris woven in North Karnataka town called Ilkal in pit looms. These are woven in cotton and silk. The Dark background of Ilkal sari provide a good base for the colors used in Kasuti embroidery. These saris had a distinct style- a 4" of border, which was generally in deep shades of red and this enveloped a well woven sari with a red pallav carrying white panels called tope and tenni. 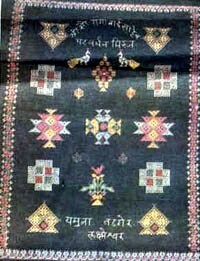 Kasuti embroidery is done above this pallav in a border called bugadi. which forms the base of the embroidery to follow. This continous border is worked in gavanti stitch,which has been known to mean knot stitch or rural stitch. After this the large patterns on the sari emerge. The Chariot Ratha,or a tree with peacocks or flowers and this distribution of motis grows sparse as it travels away from the pallav,becoming small flowers and dots. Which are worked into the pleats of the sari. Originally this embroidery was done by women with silk threads,which were taken directly from the weavers of the Ilkal saris. Later weavers sold these saris with 10" of extra silk thread in the wrap, which hung from the pallav area. This way the colours used in the embroidery blended well and the combinations were never garnish. The most readily available medium they could use was their daily clothing, which were saris,cholis,kunchis(bonnets) and lahngas or skirts. The various themes that are embroidered in Kasuti are that of gopuram, bells, chariots, temple sculpture, flowers, animals etc. Appearing same on both the sides, various designs include Dagabaji Gopura, Gandolagida, Tulasi, Vankipatti, Kayapatti, Gopi Kamala Chittu Kamala, Gundala Gopura etc. Than the geometrical designs of the Kasuti have been educed from the temple structure. Kasuti embroidery is every rich in symbolic motifs as the finest examples of this embroidery are found where vijaynagar ,Chalukya court influence was the strongest, the present Bijapur and Dharwad area's. Hence the inspiration of these womenfolk were symbols and designs which came from the temples, cavees, shrines,beautifully sculptured edifices with exquisite patterns, the flora and fauna of the region, and anything that their eyes could relate to. 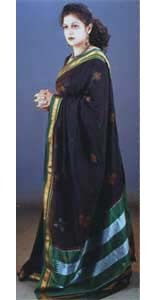 Until recently, it was customary for brides to be presented with blue black Ilkal saris with kasuti embroidery on it. In earlier days, the girls themselves embroidered this sari known as chandrakali sari, which is nine yard Ilkal sari to be readied for their marrige. A Chandrakali sari taken by the bride as she goes to her husband house was traditionally woven with indio dyed warp and black weft. In fact the use of indigo as warp was mandatory in Ilkal sarees and thus the different colours woven would have light and shade effect. The Chandrakala was considered Shubha Shagun- Good Omen. Among the Lingayats a hand embroidery khun or choli was considered a most appropriate gift for an expectant mother. The dreams and desires of these young girls find experssion in these embroidery pieces. Along the border, one may find horse, which is ridden by horseman, maybe a palanquin, which might take her to her husband's home or two love birds right in the middle of nowhere. An interesting information is the kasuti is mentioned in bible as per the christian weavers of kasuti. kannada bible shows the kasuti in the book of exodus, chapter 26 shows emboridery and kasuti. The German missionaries put a school and hospital in North karnataka and the school also has kasuti weaving in their curriculum. Guru Nanak(1469-1538AD) says Kadh kasida pahreh choli tan tu jane nari(only when you can embroidery of your own costume ,you will be considered as a woman) same as Chandrkala tradition also practiced in Nanded. The most remarkable feature about kasuti is that there is no right or wrong side. Both sides are identical. However complicated the design, the end of the design coincides with the beginning. There is no knot used in the beginning or end of the thread. A small straight stitch is placed at the beginning and end. Kasuti can be described as a delicate embroidery with geometric designs which when worked very closely can make dramatic patterns. A combination of four main stitches, all based originally on the counted thread method(equi-distance running stitches- by counting the same number of threads), allow many people to work on the same pattern and a change in the working hands does nto affect the final design. Now the designs are traced on paper or loosely woven gauge, which is then pulled off after completing the work. Kasuti Embroidery is done with four main stitches. Gavanti or Gaunti meaning konts is a double running stitch and used in straight, horizontal, vertical and diagonal lines. Neygi or Negi - the name of the stitch is derived from the kannada word neyi to weave. This darning stitch in which long and short lines are used which gives the effect of weaving. Kasuti became famous under Chalukyas of Badami and reached far corners of the country. Bana Bhatta in Harshacharita in seventh century AD describes the Rajyasri wedding describes Kasuti. 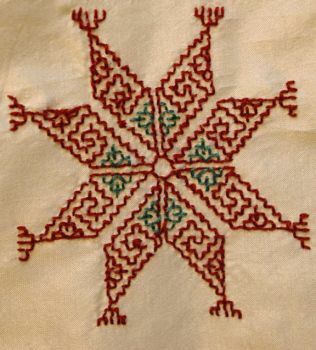 Embroidery of Austria and Hungary bears close resemblance to the embroidery of Kasuti in karnataka. Celtic stitches of scotland in particular of Holbein stitch used in Elizabethn black work resemble Kasuti of Karnataka. Holbein was called Spanisshe stitche in 17th century. 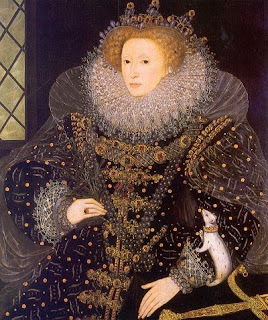 This apparently was seen in the book printed in Germany 1527, a seamstress of Elizabeth I called it True Stitch-there is no right or wrong side, why so many names for one stitch. The Answer lies in in Egypt. Fragments of printed and embroidery fabrics which have been found in the ruins of Fustat, the capital of Egypt in 14th century. Studies of these fragments which have reached several museums around the world, have revealed that these textiles were indeed made in karnataka. On studying the pictures, the similarities between kasuti and that particular embroidery which seems to have been done during the rule of the Mamluks(1270-1517) is nothing short of striking. The technique is difficult ot learn,as the patterns made by counting warp and weft threads, which when done on dark backgrounds can cause a great deal of eye strain. It is laborious process and taken years to master. Even a minor error during the embroidery process means undoing the motif and redoing it completely as the error would be spotted afar. This form of emboroidery also requires physical and mental alertness and a great deal of patience. There are many who are responsible for revival of kasuti almost made extinct under British rule. Janata shikshana smiti founded by Hukkeri rama roa in dharwad, Laila Tyabji founded Dastkaar, Asha Ben savla, Sabala a NGO in Bijapur to name a few. The uniqueness of saree is joining of the body warp with pallav warp with a series of loops locally called as TOPE TENI technique. The weaver will gait only 6 yards, 8 yards, 9 yards warp due to above TOPE TENI technique. KONDI Technique is used for weft through inserting 3 shuttles. The peculiar characteristic of the saree is joining the body warp with the pallav warp which is locally called as TOPE TENI. This technique is only used exclusively at Ilkal. If anyone requires Ilkal saree one must prepare a warp for every saree. Warp threads for body is prepared separately. Similarly pallav warp is prepared separately either with art silk or pure silk depending upon the quality required. Thirdly border portion of warp is prepared as like the pallav warp either art silk or pure silk and the colour used for pallav and on border will be one and the same. In general, the length of the pallav will range 16” to 27”. The pallav threads and body threads are joined in loop technique, a typical method which is locally called as TOPE TENI.